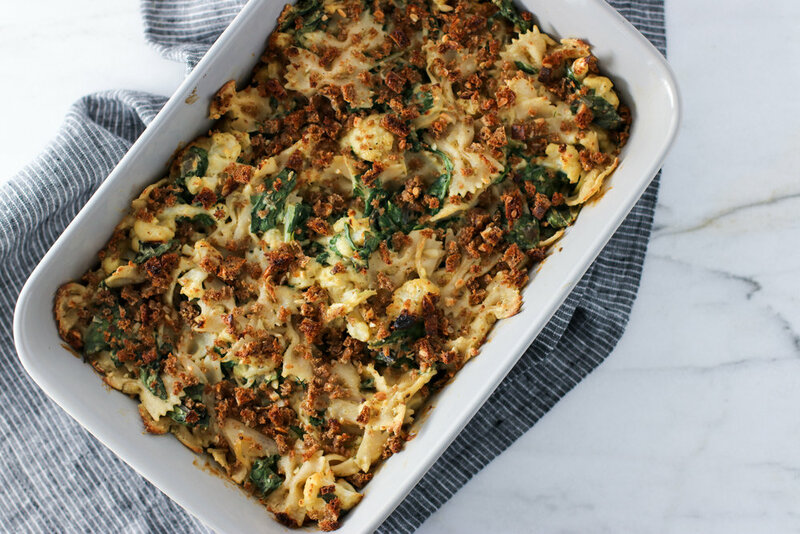 Creamy Roasted Cauliflower and Swiss Chard Pasta Bake — Erin Parekh | Live Well, Simply. Sometimes in the depths of winter, all you really want is a rich and creamy pasta dish. But that doesn't mean you have to skimp on a nutritious dinner either. This pasta bake is nearly half vegetable (! ), and the creamy sauce is made from cashews. I promise you won't even miss the dairy. Preheat oven to 400 degrees and line a sheet pan with parchment paper. Toss cauliflower and garlic cloves with olive oil, salt and pepper. Roast for 30-35 minutes until the cauliflower is brown around the edges and the garlic is golden and soft, tossing halfway through. Set aside. Add garlic, soaked and drained cashews, vegetable stock, nutritional yeast, Dijon mustard, nutmeg, and salt to a blender or food processor. Pulse until the cashews start to break down then blend on high until thick and creamy. Taste and adjust seasoning as needed. Set aside. Reduce oven to 375 degrees. Grease a 9x13 baking dish with olive oil. Cook pasta according to package directions for al dente. While pasta cooks, heat a large sauté pan to medium. Add olive oil and shallot - cooking until translucent, about 3-5 minutes. Add herbs and cook another 30 seconds until fragrant. Toss in Swiss chard with a good pinch of salt and red pepper flakes. Cook until just wilted, 3-5 minutes. Stir in roasted cauliflower and cashew cream sauce until everything is well incorporated. Then, gently fold in the pasta. Taste mixture for salt and adjust as needed. Transfer pasta mix to prepared baking dish and top with breadcrumbs or almonds and a drizzle of olive oil. Cover with aluminum foil and bake for 15-20 minutes until hot and bubbling. Remove foil and bake another 5 minutes until top has browned slightly. Let cool for several minutes before serving. This dish can be made earlier in the day and kept in the fridge until ready to bake. Cooking time will be more like 30-35 minutes. What it truly means to be healthy.